How Eric Clapton Got the Nickname "Slowhand"
I played as a teenage member of a “back-up” band, that shared the bill with Eric and the other Yardbirds, back in about ’64-’65, in Gravesend, Kent. He broke his E- string 2 or 3 times, and got the “slow handclap” from the audience, though in a rather good- natured way. When he finally got it together, the Yardbirds brought the house down. What nobody ever realised was that he was experimenting with banjo strings (much lighter) on his fender that night, and came a cropper for his endeavours to bend the strings more. 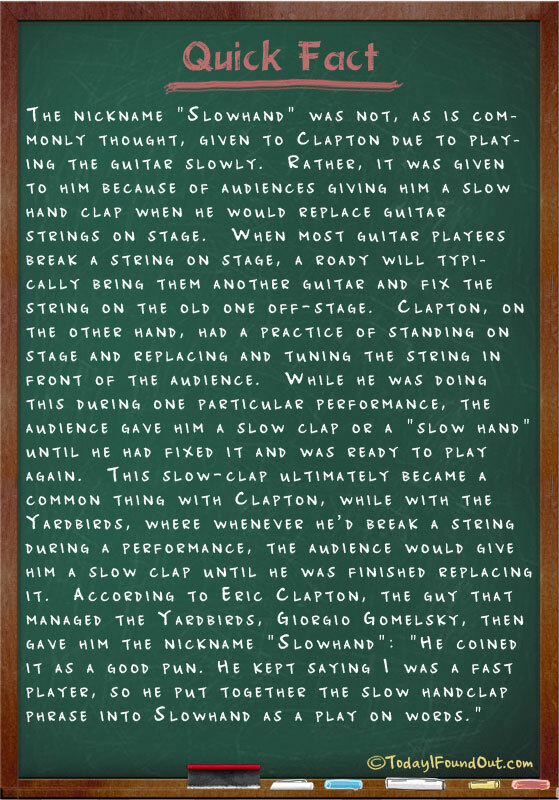 “Slowhand” of course, became an ironic nickname for one of the world’s most exceptionally talented fast (when required” guitarists. I take it that you mean my story is awaiting consideration, not moderation. That would not be necessary…I do not exaggerate.